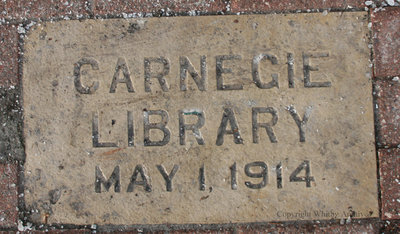 A colour digital photograph of the Carnegie Library stone plaque in front of Flaherty Dow Elliott & McCarthy Litigation Counsel Office in Whitby, Ontario. This building was originally built as a library through a Carnegie grant and was known as a Carnegie Library. Construction for the Carnegie Library began in early 1913 and the building was opened in 1914 at the north east corner of Dundas and Byron Streets. The building housed approximately 5,000 books and served as the town's library from 1914 to 1973. Today the Carnegie Library building is used as a lawyer's office at 132 Dundas Street West, Whitby, Ontario. The Whitby Public Library is now located at 405 Dundas Street West, Whitby, Ontario. Carnegie Library, January 2014, Megan Pugh. Whitby Archives D2014_001_002.